The Los Robles community gathers around Comunidad Connect founder Jon Thompson (center right) during a ribbon-cutting ceremony for the new health clinic. Emory’s Peter Roberts stands at center-left. Photo by Erin Crews. For families living in the coffee farming community of Los Robles, an isolated town in the mountains of northern Nicaragua, getting health care has long been a tricky business. Emory endocrinologist Francisco Pasquel worked alongside Nicaraguan doctors and nurses to provide free health screenings at an all-day health fair March 28. Photo by Alicia Harvey. There's the scenic, 40-minute drive over partially paved roads to get to the nearest hospital — that is, if you have a car. There's the impossible cost of private care, and the long walk to the closest clinic — when the doctor is in. There's the steady supply of cheap soda, and the lack of fresh fruits and vegetables. But change is on its way. After two years of planning and fundraising, plus a healthy dose of elbow grease, Clínica Los Robles — the community's first health clinic —ended its construction phase this spring. 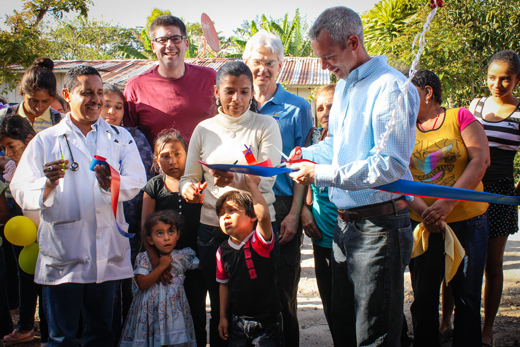 The clinic is a major milestone for the Nicaragua Community Health Connection (NCHC), a collaboration between local nonprofit Comunidad Connect and Social Enterprise @ Goizueta (SE@G), a program in Emory's Goizueta Business School. NCHC works closely with Los Robles health brigadistas — a group of volunteer community health workers — and Nicaragua's ministry of health, MINSA, to develop programs that address the proliferation of preventable diseases among the residents of Los Robles. "It was wonderful to have this group that has been working so hard, without infrastructure, and seeing their excitement about having a place and framework to continue and develop their work," said Peter Roberts, academic director of SE@G and Goizueta professor of organization and management. The community celebrated the completion of construction with an all-day health fair March 28, where Emory endocrinologist Francisco Pasquel 15PH worked alongside Nicaraguan doctors and nurses to provide free screenings and consultations. Roberts first recruited Pasquel to travel to Los Robles last fall, alongside Britt Rotberg of the Emory Latino Diabetes Education Program (ELDEP). Rotberg, who grew up in Mexico and had experience with similar initiatives in Guatemala, provides Spanish-language education and support to Latino patients in underserved communities through the program. The two worked with Nicaraguan brigadistas to conduct a survey assessing the needs of the population, literacy, lifestyle factors, nutritional patterns, the prevalence of common diseases, and how the new clinic might fit in. Around the time Roberts hit 40, he started getting bored with traditional management strategy and began to develop what is now SE@G.
"I would probably call it a mid-career crisis," he said. "I wanted my research and teaching to matter in a more tangible way. And that's how this all started." Roberts had always been interested not just in how companies make money, but also in how they survive and grow. Social enterprise became a way of "looking at those places where people are calling on business and markets to do more interesting things," he said. Soon after, he was introduced to Comunidad Connect's founder, Jon Thompson, an Atlanta native who had recently purchased a coffee farm in Los Robles with several business partners. "The general ethos for Comunidad Connect — building up structures and connecting — is very much consistent with our view on social capital and connections being primary motivators," Roberts said. "If you believe intellectually that the problem is history, isolation and endowments — and not specific people or specific behaviors — then you start to think through these issues more structurally." Now the SE@G team, which has included several MBA and BBA students, partners with Comunidad Connect on a number of high-impact projects in Nicaragua, developing a social capital framework for community leaders as well as providing more granular assistance on fundraising, planning and budget development. This line of thinking has led to a parallel focus on coffee and tourism. "If you really want to control your own destiny, make your own money," Roberts said about their approach, which emphasizes financial sustainability. "The biggest place where the citizens of Nicaragua are bleeding resources is through their coffee. And the other place where communities get short-changed is who gets paid when tourists come in." Roberts' first project with Thompson was Farmers to 40, which aims to return 40 percent of the retail price of each bag of coffee to its Nicaraguan partner farmers. Thompson is also offering "sustainable tourism" programs that include a stop on his organic coffee farm as a way to encourage job creation around the untapped potential of adventure activities like kayaking and bird-watching, capitalizing on the region's natural resources. Residents of Los Robles lined up to attend the health fair celebrating the completion of construction of the community clinic. Photo by Erin Crews. The Los Robles health clinic grew out of Nica Agua, Comunidad Connect's flagship health program in which residents earn ceramic water filters through community service. The filters have decreased diarrheal disease and kidney infections drastically since the project began and laid the groundwork for broader community health initiatives. As construction began on the future clinic site, SE@G made arrangements with MedShare to donate medical supplies and approached Pasquel, a native of Ecuador with a longstanding interest in global health. During his and Rotberg's November visit to Los Robles, it became clear that food insecurity, social stigma around exercise, and limited treatment options would be major challenges for the clinic. "Some of the important interventions there are getting different options for the treatment of common diseases like hypertension, where patients are sometimes uncontrolled with single antihypertensive medications, without therapeutic alternatives," Pasquel said. He hopes the Nicaraguan ministry of health can eventually offer ways to monitor chronic diseases, response to therapy and potential side effects of medications — including, for example, periodic kidney function, cholesterol and hemoglobin A1C testing if needed. In the meantime, Rotberg is developing a lifestyle intervention around healthy eating and physical activity for the clinic, which will focus primarily on preventive care and wellness programs. With the clinic now bringing on its first two nurses, Roberts is searching for resources for small-scale expansion. "I think it's appropriate that we're coming in structurally humble," he said. "Part of this experiment is figuring out how to get resources into the developing world, and you end up with an organization that has to plan." For Roberts, building bridges between SE@G and other schools at Emory is a critical next step, and he envisions a productive partnership with the School of Nursing. "When you think about it," he said, "everything that's needed in Los Robles sits elsewhere on campus." Roberts and Goizueta students returned to Nicaragua in May with Wesley Longhofer, assistant professor of organization and management. Longhofer led a class of 17 undergraduates on a 10-day trip to Nicaragua to discuss development challenges with local nonprofit and for-profit organizations and to participate in service projects.